Chicagoans who missed it the first time around are in for a treat. 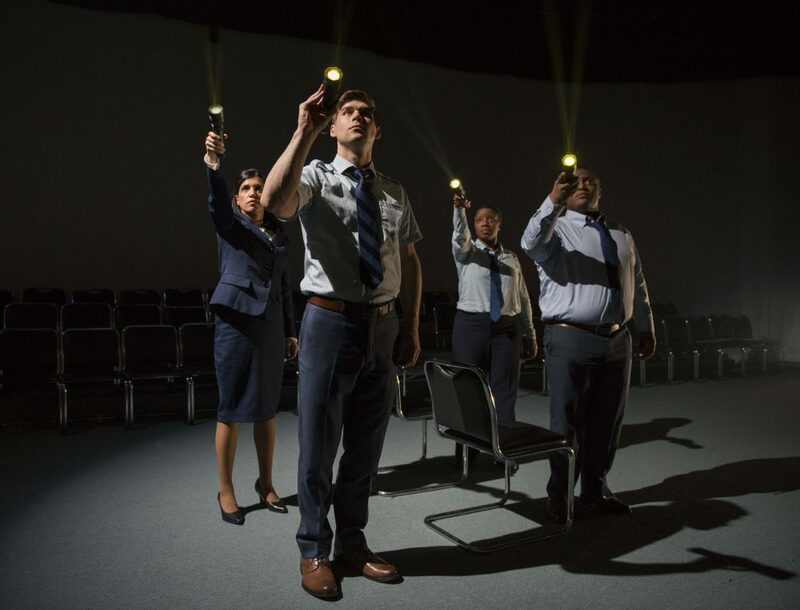 The House Theatre of Chicago is opening its 2017-18 season with a remounting of United Flight 232, the company’s Jeff Award-winning 2016 play based on Laurence Gonzales’ nonfiction book Flight 232: A Story of Disaster and Survival. Gonzales’ book tells the stories of the crew and passengers on that 1989 flight from Denver to Chicago that crash landed in Sioux City, Iowa in exhaustive detail. The amount of work he put into it is staggering, and the result was a story that evokes almost every emotion from the reader. While 111 died in the incident, 185 survived — which considering that the aircraft suffered a loss of all flight controls, is amazing. But the core of the book is really a story of people helping each other. That’s what Vanessa Stalling recognized from the first few pages of Gonzales’ book and what she would adapt and direct in United Flight 232. It first ran for five weeks in Spring 2016 and won a coveted Jeff Award. Staged by The House Theatre of Chicago, it’s set to return for for a 7-week run beginning September 1 at The Chopin Theatre, 1543 W. Division Street. Returning from the original cast are Brenda Barrie, Elana Elyce, Johnny Arena and Alice da Cunha. Joining them are Abu Ansari, Dan Lin, Carlos Olmedo, Joseph Sultani and Jessica Dean Turner. 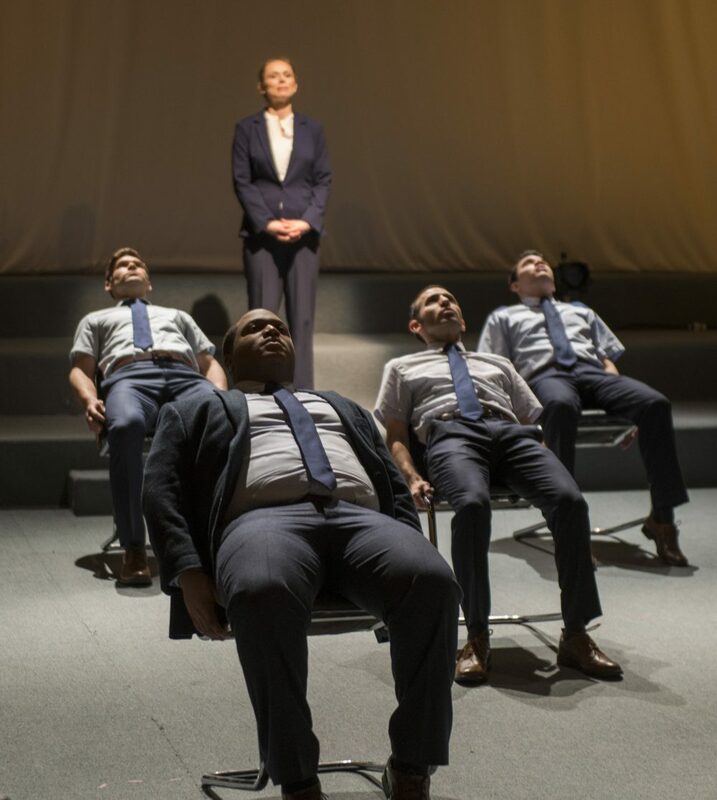 The Chicago Ambassador’s Bob Chiarito recently chatted with Vanessa Stalling about her motivation to turn Gonzales’ book into a play, her take on the story and why it’s more relevant today than at the time of its first run. Takeoff. Standing: Brenda Barrie; seated L to R James Doherty. Michael E Martin, Johnny Arena and Rudy Galvan. CA) How and when were you introduced to Laurence Gonzales book Flight 232? STALLING) I have a severe phobia of flying and one day I was driving on Lake Shore Drive, listening to WBEZ as many Chicagoans do and Laurence was being interviewed about his book. I was immediately captivated by his interview and once I pulled over, I jumped online and bought his book. And once I received it, from the the first couple pages, I really saw it unfolding as a show. CA) That’s interesting because I didn’t know there was a play and only read the book, I don’t know that I’d think of it as a possible play. STALLING) That’s what a lot of people say, and Laurence was surprised that I did it as well. What plays need is human connection and I was immediately connected to the people that Laurence had interviewed. I think that’s why I was able to see it unfold in that way. CA) It’s safe to say that he was receptive to you turning it into a play? STALLING) Very much so. I took the book to the artistic director of the theater. We were having a coffee and I put it on the table and he asked if it was my next show and I said yeah. I didn’t realize that Laurence was so close, he lives in Evanston. So we all went to lunch and I talked with him about my desire to turn it into a play and he was immediately receptive and incredibly generous. The research he did was extraordinarily comprehensive. He shared with me hundreds of hours of interviews that he did on tape. So, including the book, I had access to that research. L to R: Alice da Cunha, James Doherty, Elana Elyce and Michael E Martin. Photo by Michael Brosilow. CA) Did he have any concerns? STALLING) I think based on how I approached him and when I told him my interest was — when I read the book, it renewed my faith in what I believe, which is that humans have an inherent sense of responsibility for other human beings. I was less interested in the spectacle of the crash and more interested in that. At a time when we seem more divided and more scared of strangers, the reality is that the stranger sitting near you is more likely to do you good rather than harm. So when I talked to him and told him that’s what I see in this book, he was able to see that the material would be in good hands. What he also did was he showed me a lot of pictures to help me understand the human involvement in this event. It’s so easy for us these days to be acclimate to our TV culture and feel it’s not real. So we talked a great deal about the real violent and graphic nature of the event and how that impacted human beings. He has a lot of relationships with the people involved and he was able to introduce me to many of them which allowed me to talk to them on my own as well. The work was always done with the respect for the people involved first. CA) The book was amazing. I remember thinking about how much work he had to do and it was overwhelming. What else really stood out is that we know the plane crashes. We know some live and some die. Yet, we are on the edge of our seats. Did you fear that the play wouldn’t be as riveting? STALLING) I think with any piece that’s being created for the first time, you have no idea if it’s going to work or not. You have ambitions for it but the entire time you’re just crossing your fingers hoping it’s going to achieve the goal that you want. For me, it was about tension. That’s what I wanted to have as the atmosphere. And part of that tension is sustained by the arc, of the revelation of the horror of the event. Some of the people didn’t understand for awhile how horrific the end result was going to be. So the tension in the theater piece comes from that. L to R: Echaka Agba as Flight Attendant Susan White, Alice da Cunha as Flight Attendant Jan Murray, and Brenda Barrie as Chief Flight Attendant Jan Brown. Photo by Michael Brosilow. CA) The set is minimal, and that’s probably because the play is character driven, but it would also be hard to get a jet plane on the stage. It’s basically a couple rows of seats but it works. STALLING) I think for me the most compelling thing was the story, so it was ‘how best can we tell these stories.’ The moment you try and get the spectacle into the space, it would feel like it would undermine the story. It didn’t need it. I wasn’t interested in the plane crash. I was interested in human beings and their inherent instinct to help one another. And the flight crew’s ability to continue to be ingenious when faced with what seemed like and impossible outcome. The capacity when you have imagination and creativity to solve problems is huge. Imagination and compassion were the things that were the most striking to me. CA) I don’t know if it would translate if someone made it into a movie because they may be more focused on the crash itself. STALLING) Exactly. It would be a challenge. It’s hard to not be seduced by a spectacle like that. CA) Would a movie version be something that you’d ever consider taking on? STALLING) If ever I would be approached in that way, it would have to be something that is serving the same purpose as the play does. CA) It seems that the play may be more relevant, and you alluded to this — more relevant today with the atmosphere in the country right now. And to say it’s a play about a plane crash is inaccurate, that just happens to be the setting. STALLING) Right. And it’s way more about people coming together. We’re just human beings, all hurling toward our end, just at a slower pace than what these people were experiencing. The likelihood that someone across from you wants to help you — I believe we are born with that. If a bus is going down the street and looks like someone is going to get hit, people yell ‘Watch out!” That’s your instinct, that’s your gut. CA) Laurence has seen the play, correct? STALLING) He has. A good amount of the flight crew came to see it and a number of survivors have come to see it as well. It’s been an absolute honor and privilege to meet them and talk to them and have them see the work. CA) Any plans or thoughts about taking it to other cities? STALLING) Sure, if another city wants us, we’re here. [Laughter]. That would be great. CA) Are you still afraid of flying? STALLING) Yes – I still have a fear of flying, but it’s lessened – and I pay attention to the flight attendants pre-flight safety announcement. 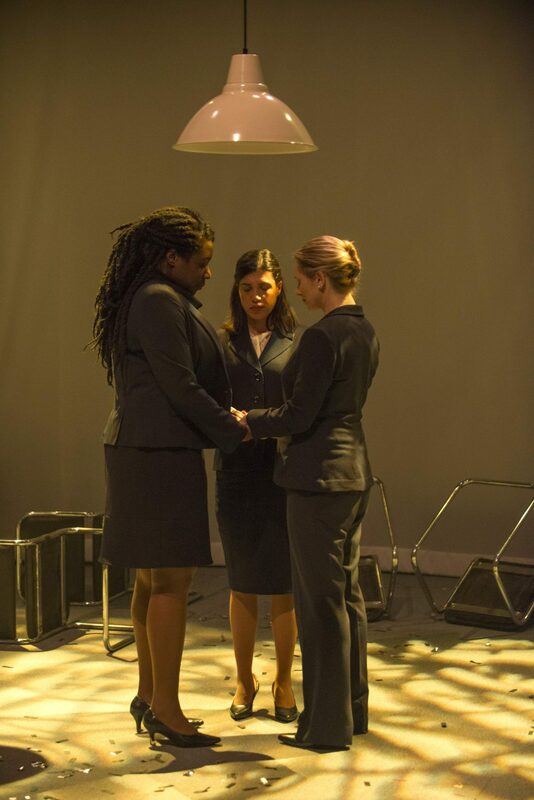 United Flight 232 is staged by The House Theatre of Chicago and runs September 1 through October 21 at The Chopin Theatre. For more information, click here.